In this post, the team at Berks Eye Physicians and Surgeons shares more details about this compelling research. 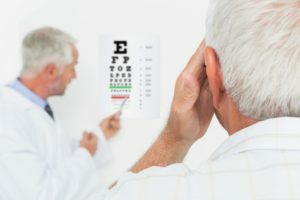 A collaboration between researchers at the University of Miami and Johns Hopkins University analyzed visual acuity and cognitive function data for more than 2,500 seniors living in Salisbury, Maryland between 1993 and 2003. The participants’ visual acuity was scored and they completed a 30-point questionnaire (called the Mini Mental-State Examination or MMSE) that tested their memory, attention span, language capacity and other cognitive tasks. This data was initially collected in 1993 and then collected again two, six and eight years later. The team was specifically looking for connections between changes in visual acuity scores and changes in MMSE scores over time. They discovered correlations between the baseline scores and between the rate of changes in the scores. As vision declined, so did cognition. Participants with the most significant loss of visual acuity were more likely to have the biggest drop in cognitive abilities. The findings did not show a cause-and-effect relationship between vision and cognition, but there was a strong association between the two factors. Based on their findings, the researchers believe that vision has a stronger influence on cognition than cognition has on vision. One possible explanation, shared by research lead D. Diane Zheng, is that significant vision loss limits activities that keep the mind sharp. Older adults with worsening vision are less likely to engage in activities or tasks that help maintain their cognitive abilities. This raises the question as to whether taking good care of vision can mitigate age-related cognitive declines. More research is needed to draw definitive conclusions. Berks Eye Physicians and Surgeons is devoted to helping individuals of any age enjoy clear vision and a high quality of life. If you are having problems with your vision or ocular health, our team would like to help. To schedule a consultation with our eye doctors, please contact our Reading, PA office today.